Happy Tuesday! I hope you all enjoyed your long weekend. I wore this look over the weekend to dinner with friends at one of my new favorite restaurants, Sea Salt. If you live in SLC I definitely recommend trying it (and be sure to get the Caprese salad). I typically build my looks from the ground up (shoes first) but this one I actually started with the jeans and blouse. I loved how the crisp white and pale gray hues pair together but being the color-lover I am, I couldn’t resist adding bold pops of color through my accessories and lips. Beautiful casual look! Love the pop of color! Absolutely chic and beautiful outfit! Love your style! Wow those shoes really pop don’t they?! Love this outfit, so simple yet so fun. In love with this look! The pops of yellow are stunning! Love the pop of neon! That yellow bag is perfect! That’s so pretty, very fresh and spring appropriate ! Fab look! 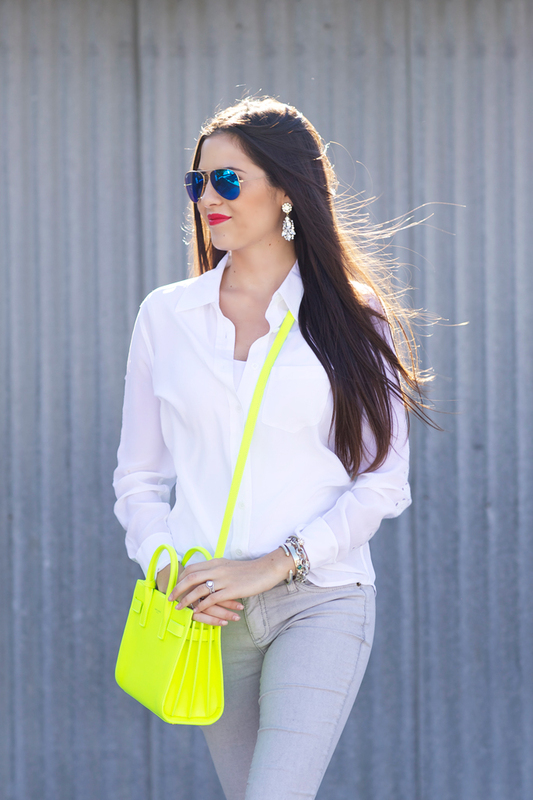 Loving the neon paired with the mirrored aviators. Haha I didn’t expect you starting with the jeans, with this outfit it is definitely the accessories which make it WOW! You must have had a very stylish dinner than! Love the neon with the neutral top and pants!!!! Gorgeous. I need to get a pair of bright heels. Beyond amazing!!! I was obsessed with that Saint Laurent the moment that I saw it on your Insta. I just love how you incorporate bright pops of color into your looks… I did a similar thing over on my blog today. Paired Current/Elliot skinnies with a Rag&Bone tee, but then added a bright pop of red with my Givenchy Antigona and some Louboutin pumps. I think the key is keeping it basic, but never plain! :) Have a lovely day. amazing jeans + blouse combo! One of my favorite casual looks of yours, Rach! This is neutral and color mixed at its best! In love! Loving these cute heels and bag – perfect bright pops of color! You look amazing!! Loving the neon.. This is by far one of my favorite looks on you!! It is so crisp and beautiful. I’ll have to buy some more neon statement items such as these… A good Caprese salad sounds great right now — I’m glad you enjoyed the restaurant! This looks so sweet! Love your pops of neon! Perfect for summer! Love the neon yellow & blue sunnies to finish the outfit! I definitely need to try that restaurant! Love the pops of yellow….such a great balance! Love the neons!! Looks great!! Amazing look. I love the pop of neon. You slayed it ! I love the combo of white and gray! So simple and fresh! I have been swooning over that bag since I saw it a little while ago. I love it! Love the neon accents! Just the right amount of color! I am loving your bag and your heels paired together! Loving the neon!!! The classic neutral base with amazing pops of colour through the accessories is perfection. The mirrored Ray-Ban glasses are such a fun way to bring color into outfits this summer! The contrast of the royal blue and neon yellow is exceptional. I posted a similar look a long time ago with grey and neon yellow! I just love that color combination! This is the perfect sunny look! The yellow color is magic! LOVE the pop of neon throughout!!! Great outfit! I love how classic and yet on-trend it is. I don’t usually build my looks around my shoes. It’s something I’ll have to try. I am in love with your shoes and your purse! Perfect for summer! Love the neon accessories! So fun! I love your bag! It is perfect for summer! Such a simple yet fun look! That neon bag is to die for! xo! 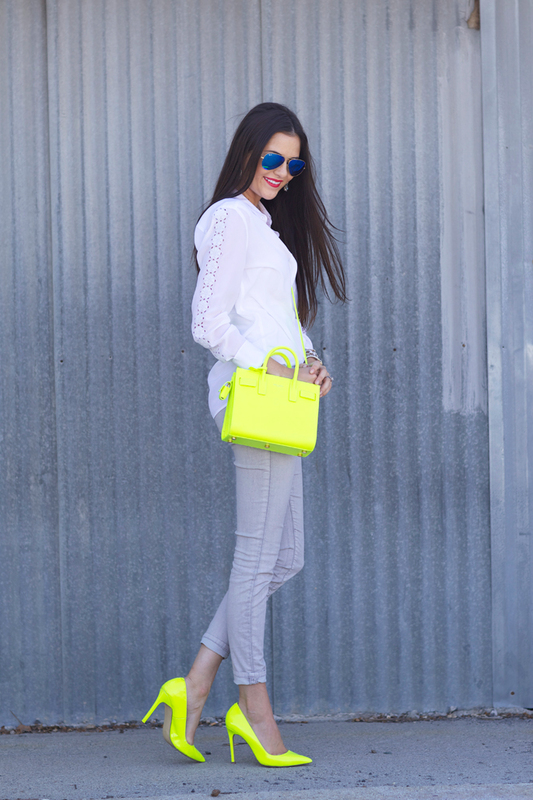 You prove that neon can (still) look good and very chic! Love the pops of neon against the cool grey! Love how clean and fresh the colors are. Love that you kept your blouse and jeans rather neutral and then added a perfect pop of colour with the bag and shoes. Wonderful for summer in my opinion! I love your outfit. Your jeans are like the perfect shade of grey. Love the bright pops with your shoes, purse, and lipstick. So fun! The neon yellow makes this classic look so fun and modern! Love the matching shoes/purse combo! Love your bag! So much pop in such a little purse! Love the pop of neons. You turned a simple look to something that stands out! Love the pops of neon! Such a fun look! Love this! That bag is so perfect, and I love the heels paired with it. 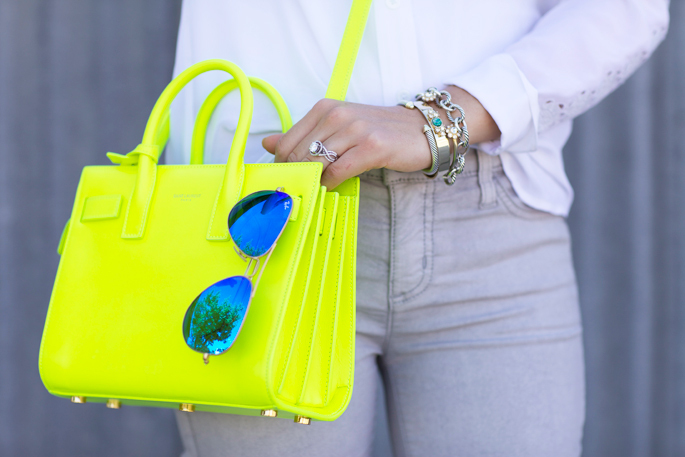 Loving the combination of you bright yellow bag and the bright blue sunnies, looks fabulous! I absolutely love those pops of neon! Such a cute look!! I love this look!! You look great and the pops of neon is fabulous!! I love the look minus the shoes… just a bit too much neon for me but work it girl! Amazing collors love those blue RayBan’s to this look! Love this neon bag!! The pump and cross body are the perfect match!! Love the yellow in this outfit! I love the pops of neon!